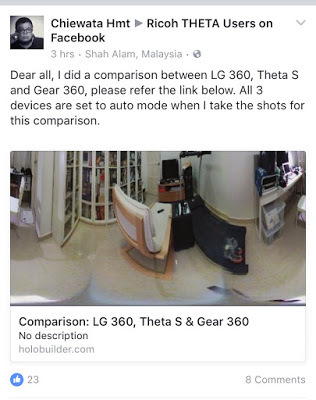 Malaysian photographer Chiewata Hmt posted a side-by-side comparison between photos from the three major consumer 360-degree cameras: the Ricoh Theta S (reviewed here), Samsung Gear 360 (reviewed here), and LG 360 Cam. I’m also working on a detailed direct photo comparison between the Theta S and the Gear 360. I will be comparing sharpness, dynamic range, exposure latitude, chromatic aberration, flare, and other factors. In the meantime, here is a video comparison between the Theta S, Gear 360, and Kodak SP 360 4k dual pro.